Thinking about moving to Teaneck? Already here and you want to know more about us? Well, you have found the right place. We hope this section will give you some basic information on who we are, as well as an overview of Teaneck. We would love to have you spend a Shabbat with us, so come on down!!! Teaneck, NJ, has a vibrant Jewish community, with several shuls, Jewish elementary school, & Jewish high schools. There are several Kosher restaurants, a mikvah and an eruv (well, 2 actually). The Teaneck-Bergenfield Area Eruv consists of two separate areas, North and South of Route 4. Each area constitutes a complete, independent Eruv, designated as the Northern Eruv and Southern Eruv respectively. The two Eruvin are linked at specific locations by crossovers, as described below. Please note that it is possible for one Eruv to be operable even when the other is not. The Northern and Southern Eruvin are supervised and maintained by the rabbinic authorities of each area. One should ascertain before Shabbat whether the Eruv is functioning. This can be accomplished by calling the Eruv line on Friday afternoon at: (201) 530-0222. It is generally not permissible to carry on any street designated as a border of the Eruv. One must contact his/her Rabbi regarding utilization of any border streets. One may carry on either side of the following crossings at Route 4: the Palisades Avenue underpass, the Windsor Road underpass and the Lincoln Place footbridge. One may carry only on the western sides of the Sussex Road-Garrison Avenue bridge and the Queen Anne Road underpass. Please note: The approaches from the Northern Eruv area to the crossovers at Sussex Road and Queen Anne Road must be utilized with particular care and attention to the exact borders of the Eruv. 1. The area must be converted into a reshut hayachid (private domain). This is accomplished via a series of wires and strings that surround the area in accordance with proper halachic procedures. 2. An Eruv Chatzerot must be established, which converts all of the separate private domains into one large private domain. Everyone who uses the Eruv should know the location of the matzah used for the Eruv Chatzerot, and all should realize that they have a portion in the matzah and a right to utilize it upon request. Please be advised that the Eruv Chatzerot for the Northern Eruv is located in the home of Rabbi Neuburger, 312 Briarcliff Road, and the Eruv Chatzerot for the Southern Eruv is housed in Congregation Beth Aaron. 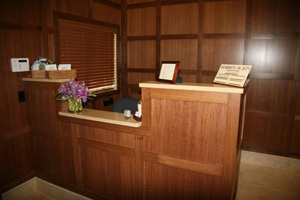 The Teaneck Mikvah serves the Teaneck, Bergenfield, and New Milford community. First built in the 1970s, the Teaneck Mikvah recently underwent a full scale renovation and construction project to meet the needs of our growing community. The new, state of the art Mikvah includes 18 preparation rooms, 4 Mikvaot, special handicap accessible facilities, an exclusive preparation room for brides and a new Keylim Mikvah. The Mikvah Assocaition has also opened a Friday Night Mikvah, located in close proximity to our shul. 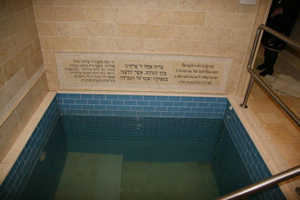 To participate in the Mikvah Capital Campaign, please visit the Mikvah Dedication Page. To schedule an online appointment for nightly usage, please click here. We are fortunate to have the RABBINICAL COUNCIL OF BERGEN COUNTY (RCBC), our local vaad, ensuring the highest levels of Kosher at local establishments. Please click here for the most recent RCBC Kosher List.